Saturdays are made for exploring and I try to do that as much as I can, schedule and weather permitting. Luckily, I live within a two-hour drive of many interesting destinations, so there are still some "new-to-me" areas I've yet to visit that require relatively little time spent on the road traveling. Shepherdstown made its way onto my radar when I was flipping through television channels and was intrigued by a show titled, "The Ghosts of Shepherdstown." It occurred to me that I'd never been to that particular area of West Virginia, so my husband and I executed a plan to find out what the buzz was all about. One thing I especially dislike about winter is that many destinations are closed for the season, so options are somewhat limited. For that reason, we planned a short, overnight stay, with the intention of returning at a later date when more attractions (like the Historic Shepherdstown and Museum) are open. Our room at the Jacob Rohrbach Inn. When speaking with the proprietors, we broached the subject of the town's paranormal reputation, but it was soon obvious that they really weren't all that interested, choosing instead to focus on the history of the area. After all, the Battle of Antietam, also known as the Battle of Sharpsburg, took place only a mile or two away, with some fighting occurring in the town itself. The historic confrontation became known as the bloodiest, single-day battle in American history, with a combined tally of 22,717 dead, wounded, or missing. History buffs have been known to spend many hours at the nearby battlefield. Grounds are open for touring from 9 a.m. to 5 p.m. seven days a week, year round. The National Park Service provides helpful information on planning a visit via their website. Details are available here. A light snow began to fall as we made our way to the alpine-style Bavarian Inn's Hunt Room for lunch. The cozy restaurant, which features roaring fireplaces and antlered chandeliers, was an ideal respite from the frigid weather. Perched on a scenic bluff overlooking the Potomac River, the AAA Four-Diamond property is comprised of 72 rooms situated on 11 acres. Additional options include casual dining in the Rathskeller, or more formal dining in the Potomac Room overlooking the grounds. The grounds at the Bavarian Inn. Dining at the Hunt Room at The Bavarian Inn. After lunch, we decided to drop by the Shepherdstown Visitor's Center on Princess Street to pick up a few brochures. 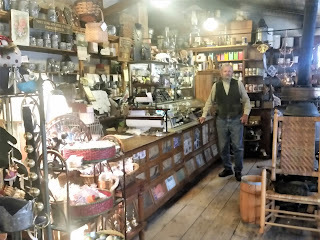 While there, an ambassador recommended a trip to O'Hurley's General Store. When we pulled up to the inauspicious building, we couldn't help but wonder what we had gotten ourselves into, but it turned out to be a very charming experience. A wood-burning stove keeps the place warm and cozy and a big, furry feline oversees operations. 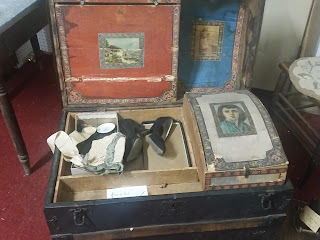 Visitors can choose from a array of merchandise, from books, to tools, to jams, jellies, hats and hardware, some of which I understand dates back to the early 1900s. You can visit their website to see all they offer here, but you may end up scratching your head like I did when you see coffins among the items listed. I'll admit I didn't spot any of those while touring the rooms full of merchandise, but then again maybe I overlooked them since I'm not quite old enough to be in the market for one just yet. Nonetheless, I'll keep the place in mind for later consideration. Maybe I'll get a good deal. Come and get yer coffins here at O'Hurley's General Store. The owner of O'Hurley's poses for a photo. O'Hurley's General Store decorated for the Christmas season. This sign spoke to me--perhaps I was possessed. The kindly old owner posed for a picture for me and handed me a brochure. "That's me, in the same place, just 30 years earlier," he said, with a chuckle. After our visit to the General Store, we headed to the heart of downtown where several blocks of shops offered a variety of merchandise from jewelry, to antiques, wine, crafts and clothing. Four Seasons Books is a family owned bookstore dating back to 1991. A helpful employee at Grapes and Grain Gourmet assisted us with a wine purchase. Creative Procrastinations claims to have "a little of everything." Some of the downtown structures are listed on the National Register of Historic Places. Of all the buildings located downtown, I believe the one below was my favorite. Built in the Beaux Arts style, it was constructed in 1906 and once served as a bank. I was disappointed to see that the restaurant that operated there recently went out of business; hopefully someone with a vision will fall in love with it and purchase it soon. The Yellow Brick Bank Building. This following building is listed as belonging to actress Mary Tyler Moore, who is known for purchasing old structures that once belonged to her family. When we visited Winchester, we learned that she bought Stonewall Jackson's headquarters, because it once served as her ancestral home. The George Tyler Moore Center for the Study of the Civil War, Shepherd University. Located on the corner of NE German and King Streets is a Greek Revival structure erected in 1859 by Rezin Davis Shepherd. Its initial purpose was to serve as a town hall. After the Civil War it operated as a county courthouse and by 1872 it became part of a teacher's college known as "Shepherd University." Another stop on the walking tour is the Entler Hotel and Shepherdstown Museum located at the Northwest corner of German and Princess Streets. The structure operated as a hotel in 1809 and in later years served as a dormitory for students, WWII Navy and Air Force cadets and college faculty. Today it operates as a museum from April through October. The Entler Hotel is listed on the National Register of Historic Places. During our walk, we took a break to indulge in a libation at Bistro 112. The building was originally constructed in the 1830's as a haberdashery and cigar shop with the residence upstairs. Today the charming boite attracts customers from miles around for its outstanding French cuisine. Further down the road is another popular restaurant known as "The Press Room." The Press Room was once the base of operations for The Independent, a newspaper which operated from the 1900s to the 1970s. Today it operates as an eatery, offering a selection of soups, salads, grilled seafood, meats and pasta. Next door to The Press Room is the Opera House. The current structure was built in 1909, replacing a 100-year-old building. Moving pictures were shown here through 1956. Approximately 35 years later, after extensive renovations, it reopened as a movie theater. These days it serves as a venue for film and live music. Another building of note on the walking tour is the old "poorhouse" which tended to the elderly and poverty stricken. Dating back to 1805, the poorhouse started out as a log cabin before being enlarged and upgraded with wooden siding. Iron rings in the attic rafters cause some to speculate that residents may have been restrained. "The Poorhouse" where kids of a certain vintage were accused of "putting" their parents. These are just a few highlights along the Shepherdstown Walking Tour. If you're interested in taking the self-guided tour yourself, you can download a more comprehensive listing of all the historic structures here. For dinner, we headed to Old South Mountain Inn in nearby Boonsboro. People come from miles around to visit the historic restaurant. On the night we visited, the extremely large parking lot was packed, making finding a spot rather difficult. Thankfully, there were only a few people waiting in line inside and we were seated in just a few minutes. Bar area of the Old South Mountain Inn where patrons can wait for their table while enjoying a libation. Located atop historic Turner's Gap, the Old South Mountain Inn is said to date back to 1732. Over the years, the Inn was visited by Henry Clay, Daniel Webster and several presidents. Its long history is detailed on the website here. Antique trunk spotted at Market Place Antiques in Boonsboro. Trunk aside, the shop was a great place to browse, with scores of vendors under one roof and was a nice way to end our visit to the historic area. And just in case your wondering, no, I didn't experience any paranormal activity. Oh well, there's always next time.